It doesn't take a lot to make delicious sweet potatoes. 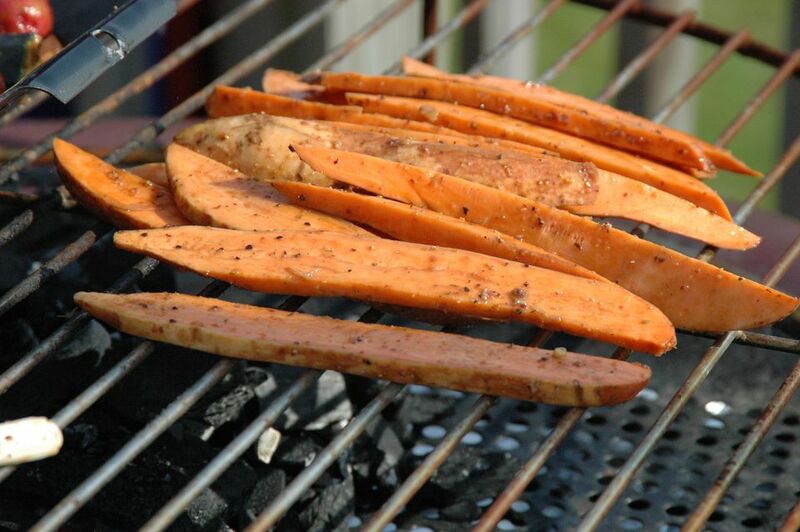 These grilled sweet potato slices get a quick blanch in hot water and then hit the grill to cook up hot and fast. The best part is that most of the preparation can be done in advance. Cut sweet potatoes into 3/4-inch slices. Bring 3 quarts of water to a boil. Add salt and potatoes. Boil until potatoes are just starting to soften, about 8 to 10 minutes. Cool and remove peels. Combine butter, brown sugar and cinnamon, set aside. Place sweet potato slices on preheated grill over a medium-low heat and cook for about 10 to 15 minutes, turning a few times during cooking process. During the last 5 minutes, begin basting with butter mixture. Keep an eye on the potatoes as this both butter and sugar can cause flare-ups on the grill. So keep the lid open for this part of the cooking. When the sweet potatoes as soft through the middle and browned on the surface they are ready. Remove, brush once more with butter mixture and serve. Can You Make Your Own Sweet and Spicy Grilled Veggie Packets?